Place the flour, baking powder and bicarbonate of soda in a big bowl. Break the eggs on top and add the milk. Mix until really smooth, using a whisk. Add the cheeses, chives, corn, salt and pepper and whisk to combine. Heat 2 teaspoons of the oil in a large non-stick frying pan over medium heat. Using a ladle or a cup, add about ⅓ cup (80ml) of the mixture to the pan for each fritter (you can cook 2–3 at a time, just leave yourself enough space for flipping). 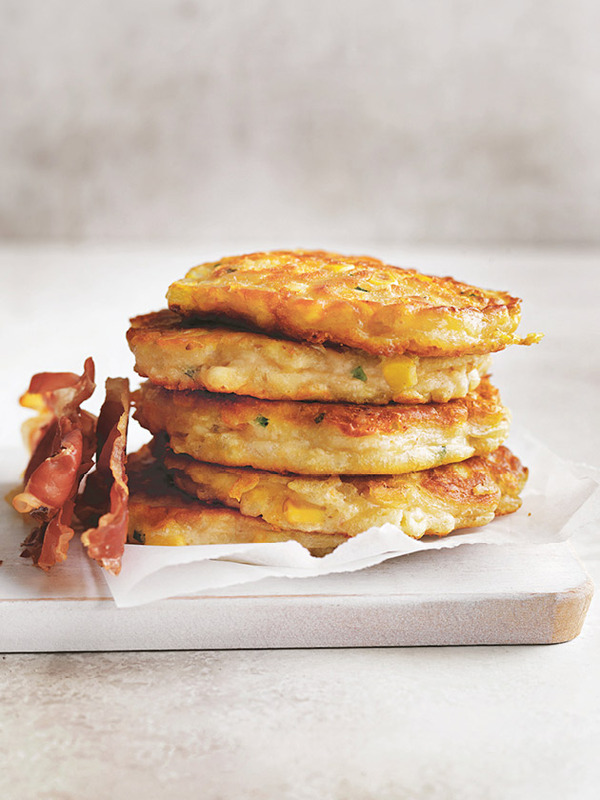 Cook fritters for 2–3 minutes each side or until they’re puffy, golden and cooked through, using a turner to flip them. Add more oil to the pan as you need it.